In recent weeks, the USD has shown some hesitation in continuing the previously strong downtrend that has yielded trading opportunities for trend-following traders. And since the last week of January, with the weekly and/or monthly USD potentially due for a healthy retracement, the daily timeframes have begun to demonstrate range-like consolidating behaviour. 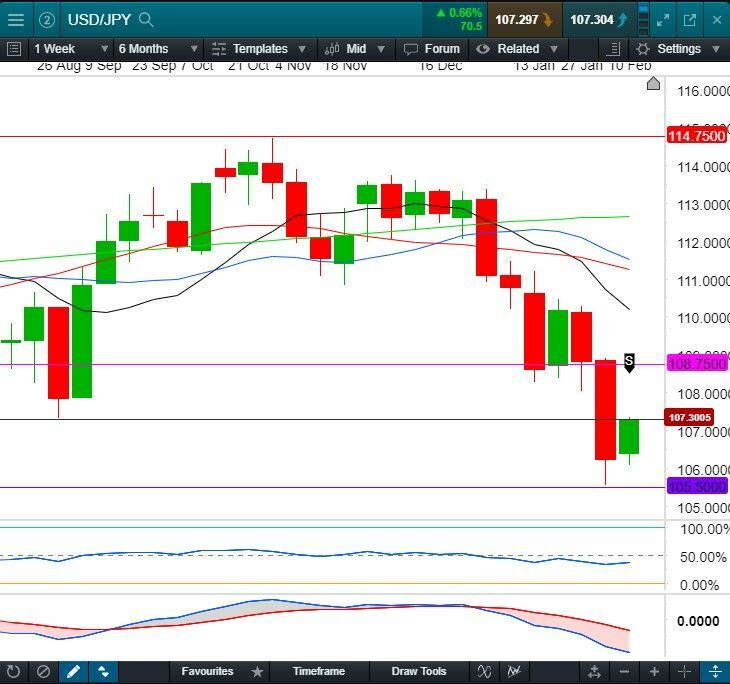 Now traders are patiently waiting to see whether the dollar will take this opportunity to retrace on the monthly timeframe over the coming weeks. Meanwhile, the Yen has decided to march to the beat of its own drum. Most significantly, after having ranged for an entire year, price action has finally and with some determination broken free of its cage and started to move. 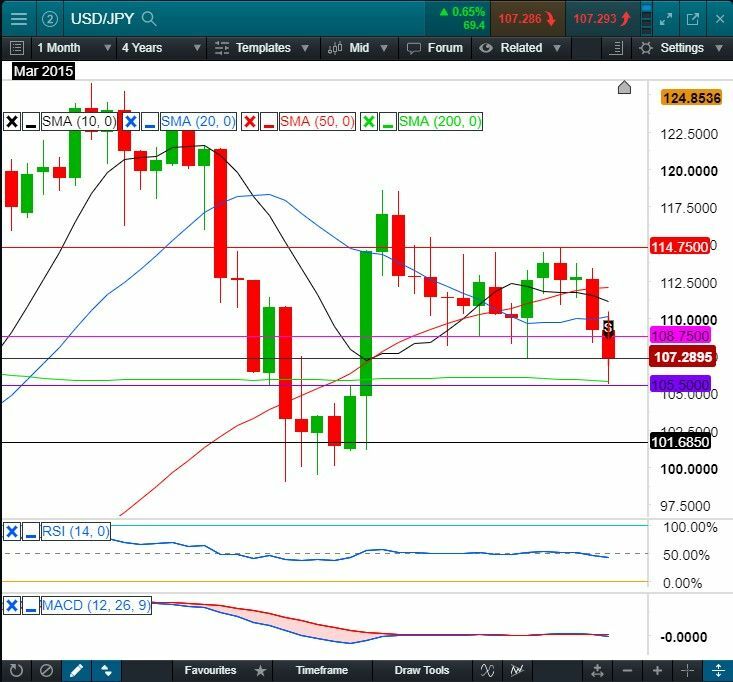 Looking at the USD/JPY charts below, and starting with the monthly, the momentum of price is now showing both lower highs and lower lows. That confirms that the monthly, which is now through the range’s floor of 108.75, is in a clear downtrend. Although there is some light support at 105.50, the level to watch out for is 101.75. That is quite a bit further down, but easily achievable given that the monthly has not had this much free range in a long time. Moving on to the weekly chart, the structure of the downtrend becomes healthier and clearer: the moving averages (MA) are beginning to form the right order, and price’s movement is not too over-extended. We also have double confirmation from the indicators that the trend’s momentum is normal - i.e. healthy and not just running around in a headless fashion. And finally, we arrive at the daily timeframe, where price action is demonstrating stronger trending behaviour. It is interacting beautifully with the 10 & 20 MAs, which is where we see the sell zone. I will be stalking here for an entry opportunity in the coming days this week. It’s important to note that price has a recent level of broken support. That could provide not only resistance to the current retracing flow of price, but also potential protection for my stop-loss if I place it above this level. I’ve highlighted the area where I’ll be waiting for a small candle to form indicating the return of the bears as they seek to regain control and begin the next extension to the downside. Never counting my eggs before they’ve hatched, I’ll be taking some profit ahead of 105.50, and at the same time keeping part of my trade in with a trailing stop-loss. And if the market isn’t feeling too chicken, it may head down to 101.75. This is certainly the prize meal I’m aiming for this week, but patience and timing, as ever, is everything. Get the daily updates delivered straight to your inbox.